Some friends of mine recently discovered a forgotten 1956 John Wayne film entitled The Conqueror. Since we all have great respect for that classic Western actor, we decided to watch that movie and see why it’s been lost for all these years. I thoroughly enjoyed it, even though I found the plot incomprehensible, the characters dim-witted, the action silly, and some parts rather racist and misogynistic. The film comes across as a textbook example of unintentional comedy. This movie was filmed in southern Utah, just like pretty much every other John Wayne movie, and all the action sequences feel like typical Cowboy-and-Indian fights. So there’s nothing in those areas that makes this movie better or worse than any other John Wayne movie. The biggest difference is who he is portraying. 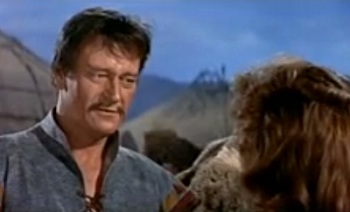 In The Conqueror, true-blue, all-American John Wayne is playing Genghis Khan. I’m dead serious. Depending on your point of view, this could either be extremely offensive or unbelievably hilarious. I’m in the latter camp, so I had a ball watching John Wayne play himself, not even trying to change his mannerisms or speech pattern to sound remotely like a Mongolian warlord. This movie has to be seen to be believed. In fact, here’s a link to watch The Conqueror on YouTube. Do yourself a favor and watch it right after you finish reading this review. 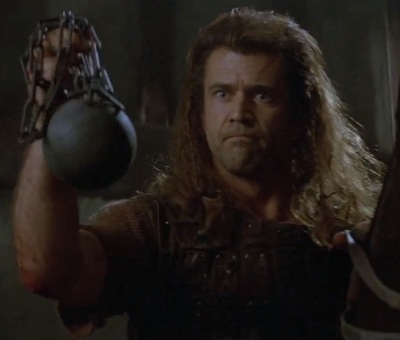 Or watch it first if you care about spoilers because I’m about to describe all the similarities between The Conqueror and a truly great film: 1995’s Braveheart. These movies aren’t exactly the same, like some other films I’ve compared, but they have a lot of interesting things in common that are worth noting. So let’s unsheathe our swords and give a battle cry as we charge into this Movie Matchup of The Conqueror and Braveheart! The main character falls in love with a woman on the opposing side. He is motivated in large part by revenge. He is shot in the chest during battle. He kills a shaman/ Scottish lord for his treachery. He is supposedly betrayed by a friend and captured by his sworn enemies. He refuses to take medicine to dull his agony. Someone is crowned king in the end. Now let’s talk about each of these points in greater detail. The hero falls for a woman who is closely related to his enemy. I’ll refer to John Wayne by his character’s name Temujin for the rest of this review. Early in The Conqueror, Temujin kidnaps a woman who just so happens to be the daughter of his sworn enemy, the leader of the Tartars. She hates him at first (maybe it has something to do with how roughly he treats her), but she ultimately loves him back for no good reason. She’s just fickle that way, I guess. In Braveheart, Scotsman William Wallace falls in love with a Princess, who is the daughter-in-law of the English king. She thinks he is a barbarian at first, but she is impressed by his knowledge and courage, and she eventually falls deeply in love with him. All of this takes place in the second half of the film. The Conqueror skips past the first hour of Braveheart and gets right down to the action. I definitely prefer Braveheart’s slow buildup, which gives us a chance to feel for the characters’ plight rather than just laughing at their hammy acting. Revenge is the primary motivation for the hero’s actions. In The Conqueror, Temujin wants vengeance on the Tartar leader for killing his father (an event we never actually witness, so it’s hard to really feel bad about it). In Braveheart, the English king and his lackeys kills Wallace’s kinsfolk, father, brother, and wife in the first hour. Finally, Wallace decides he’s had enough and he starts an uprising that unites the Scots in the cause of freedom. During the second battle in the film, the hero is badly wounded with an arrow in his chest. Temujin handily defeats the Tartars in his first encounter with them, but the second time he’s caught by surprise and wounded with an arrow, which forces him to hide to elude his pursuers. Wallace also defeats the English in his first battle, but his forces are overwhelmed the second time around. In the midst of that unfortunate encounter, Wallace is seriously injured with an arrow. Rather than running and hiding, though, he fights on and has to be dragged off by his friends to avoid capture. The hero deals with internal treachery before striking back against his external enemies. After his disastrous second encounter with the Tartars, Temujin realizes a shaman has been feeding him lies, and he deals with him in typical fashion at the end of his sword. Wallace also decides to clean his house after his decisive defeat. He goes after the Scottish Noblemen who refused to help him, smashing one’s skull and slitting another’s throat to send a message that they must unite or die one by one. The hero falls into a trap and is captured by his enemies. Temujin’s friend accidentally leads a group of Tartars to his location when he was trying to bring him supplies to help him recover from his arrow wound. It’s never resolved whether or not the friend meant to do that, but he’s such an honorable man in his other scenes that I’m positive he didn’t mean to betray Temujin’s trust. But no matter the intentions, the result is that Temujin is imprisoned and sentenced to death. But since this is a John Wayne movie, we know he won’t really be killed, and sure enough he escapes the very night after he is captured. Wallace isn’t so lucky. The English capture him after he comes unarmed to supposedly talk with Robert the Bruce, a trusted Scottish Nobleman. Robert is completely unaware of the scheme. Wallace is sentenced to death, and there’s no escape for him. All he can do is die with his dignity intact. In a moment of crisis, the hero refuses to take medicine, even though it would spare him great pain. After escaping from the Tartars with the help of his lover, Temujin is offered some sort of ointment or medication to ease his pain, but he just throws it away without a word. Apparently he subscribes to the “Pain don’t hurt” mentality found in so many action movies. Wallace is also offered some medicine to dull the pain he is about to endure during his execution, but he refuses because he wants to be in full control of his mind so his murderers won’t have the satisfaction of hearing him wail senselessly in his final throes. After a tremendous final battle, a new king is crowned. Like all good John Wayne movies (and the bad ones, too, actually), The Conqueror ends with a big, overblown battle. Temujin’s army defeats the Tartars and he is renamed Genghis Khan. A whole lot of conquering awaits him. In Braveheart, Wallace is killed, so he can’t be named king of Scotland, nor would he want that title. But Robert the Bruce finally steps forward and takes his rightful place at the head of his people and leads them to victory against the English. Neither The Conqueror nor Braveheart is meant to be taken as historically accurate. They just take larger-than-life historical figures and build an engaging story around them. Mel Gibson is absolutely brilliant in his nuanced portrayal of Wallace, and he did an equally excellent job behind the camera. John Wayne is silly as Temujin, and I love him for it. He’s not meant to be taken seriously. I’ll sum up these two films by saying that Braveheart is great, and The Conqueror is so bad it’s good. Now go enjoy a huge treat by watching The Conqueror. You Khan do it! This entry was posted in Movie Matchups and tagged braveheart, films, history, john wayne, movie review, movies. Bookmark the permalink.